The JBTM are bushings resulting from the need to find a solution to the problem of repairing damaged housing on any work machinery (Earth-moving, Agriculture, Drilling, Mining, etc.) or part of it and/or equipment. 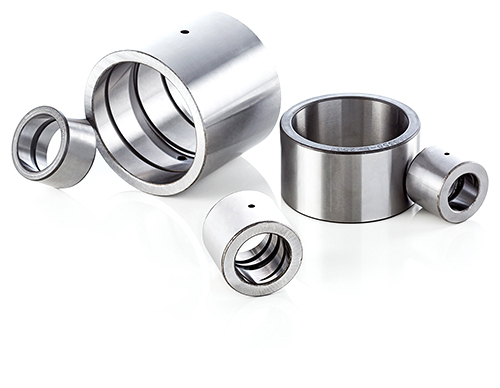 In particular, this bushing has an inner surface which has been hardened to 58-62 HRC and ground, plus a soft 40-42 HRC external surface (including the two faces), which can be machined (turned) to the required diameter. The thickness of this special bushing is greater (>7.5 mm) than a standard bushing so that it can be better adapted to the type of housing (which has lost its initial dimension due to wear). So, instead of replacing the housing and the bushing, we only replace the latter with a JBTM turned to the external diameter, so the best interference fit between the housing and bushing can be obtained, saving time and money. To the best result, we recommend machining the housing first and then, the JBTM bushing. We recommend assembling it using a press or nitrogen with machining of the respective housings with a tolerance of H7 or maximum H8. • Standard tolerance u6 C8. • Quality guaranteed by the grinding of both surfaces (the inner one to allow the correct play with the shaft, to reduce friction and obtain excellent performance; the outer one to use as the permanent bushing as well) and by flexibility of use. The JBTM bushings can be produced with a minimum inner diameter of 30 mm and a maximum of 100 mm. Other sizes can be produced on request based on the customer’s design.